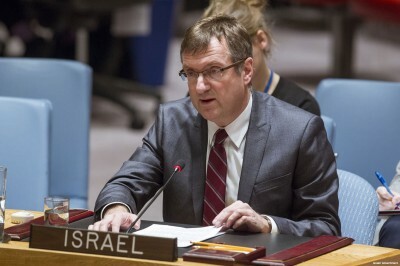 On 16 October 2015, Israeli Ambassador Roet addressed the UN Security Council in an emergency session on the escalating situation in Israel and Palestine. Below are excerpts of his speech followed by facts disproving them provided by the Palestinian government in a statement released yesterday. Fact: The Palestinian people are a defenceless and unarmed population suffering gross violations of human rights under Israel’s illegal occupation. It is in fact the Israeli occupation that is the source and context of all of the violence, violence that has been inflicted by Israel with total impunity for over 48 years on the Palestinian people. Yet Israel has the audacity to oppose international action to protect the civilian population. Fact: Individuals that carried out the alleged stabbings acted alone and without the support of others. On the contrary, Israeli settlers carry out terrorist acts with Israeli state protection – military and political. Nearly 200 acts have been carried out by settlers against Palestinian civilians in the past month. These include stoning and firebombing Palestinian cars, houses and civilians; trespassing on villages and property; setting fire and damaging crops; and attacking, beating and shooting at Palestinians, including children. Fact: Israel, the occupying power, is not a victim in this situation. Since 1 October 2015, over 1,850 Palestinians have been injured and at least 46 killed, including at least 18 in demonstrations. The Israeli occupying forces (IOF) have greatly intensified their excessive use of force, especially to suppress protests, through the use of rubber bullets, tear gas, sound canisters and live fire. Fact: The root cause of the current violence is Israel’s half century illegal occupation of the Palestinian land and its subjugation of the Palestinian people. Palestinians, many of them children, are killed, wounded, arrested and harassed and intimidated every day while their property is seized, demolished, or bombed. This incessant oppression leaves little hope for a peaceful and stable future, deepens despair and encourages the oppressed to resist injustice. Fact: The IOF has intensified incursions and attacks at Al-Aqsa Mosque compound by allowing terrorist settlers free reign to storm the holy site in attempts to change the historic status quo. Between 14 January and 15 September, the IOF and settlers under their protection carried out more than 450 attacks against this holy site and Palestinian civilian worshippers. “We will not provide immunity to any rioter, inciter, or terrorist, not anywhere and under no conditions. Israel’s security forces have no limits when it comes to defending Israelis,” said Benjamin Netanyahu, prime minister of Israel, on 5 October.“Palestinians have to understand they won’t have a state and Israel will rule over them,” said Eli Ben-Dahan, deputy defence minister of Israel, on 10 October. “The entire Palestinian people is the enemy…in wars the enemy is usually an entire people, including its elderly and its women, its cities and its villages, its property and its infrastructure,” said Ayelet Shaked, Israeli justice minister, on 7 July 2014. Fact: Indeed, they don’t occur in a vacuum. They occur when there is constant impunity for brutal crimes by the IOF and terrorist settlers. This includes the burning of teenager Mohammed Abu Khdeir, the arson attack of the Dawabsheh family home, and the mounting executions of Palestinian civilians, including children and youths by the IOF with live fire. When the IOF investigates soldiers for suspected criminal activity against Palestinians, it closes 94 per cent of cases without prosecution. Fact: The Israeli government tells the UN it’s prepared for negotiations while telling the Israeli public a Palestinian state will never come to be. On 18 October, Justice Minister Shaked avowed: “We are against a Palestinian state. There is not and there will be no Palestinian state.” Direct negotiations are inherently asymmetrical as Palestine is under Israel’s occupation. The international community must present a multilateral and time-bound negotiating process to salvage the prospects of peace, beginning with concrete steps to end this illegal occupation without delay.